"Life is what happens while you are making other plans"
This year has simply wittered away with unforseen happenings, nothing to blog about but enough to keep me from my blog. My books are still overflowing the bookshelves and table tops around the house. Will I ever take control? We shall see. But the most recent happening in my life, a fractured wrist, has somehow bizarrely goaded me into action. I can type with one hand and so I will begin again with a Christmas story, a true story, for all the bloggers who so generously share their lives with us. It is now more than fifty years since my husband and I, new immigrants with two little babies, arrived from England to our first destination in Canada, a remote gold mining town in northern Ontario. No description could have prepared me for the vast forbidding landscape. The little townsite and mine were surrounded by dense impenetrable bush and great outcrops of rock , gashed by the only access to other human settlements, a two lane east-west highway, mostly without sidewalks. All my spirit of adventure evaporated when the implacable bitter winter descended on the land in early November and an all encompassing homesickness took over my life. This place could never be home. Home was all the things that I had always taken for granted. Home was streets with pavements and street lights, gardens with hedges, gardens that sometimes boasted a Christmas rose. Home was where my accent was never a matter of comment and where no one ever asked, however kindly, how I liked it here. The advent of Christmas made it all seem worse and, for the first time in my life, I dreaded its coming. Then, quite unexpectedly,we had one of those brilliant sparkling winter days that only the north country can give; bright blue cloudless sky, dark green skyline of coniferous forest and great rocks, sparkling snow and sparkling frosty air. I watched from my window as the local children on their way home from school made snow angels in the newly fallen pristine snow where no one had trod. To me this was something quite new and enchanting,the occasional snowfalls of south east England were mostly sparse,wet and slushy. Later that night, after our babies were asleep, when the temperature was dropping so sharply that the very timbers of the house audibly protested with snaps and crackles, we wrapped up warmly and stepped out onto our doorstep to view another northern phenomenon that, even through my gloom, had touched my imagination and filled me with awe: the northern lights, aurora borealis, the heavenly dancers. In the vast uncluttered dome of the northern wilderness they were magnificent at any time of year,but in the frosty winter night they were an enchantment. On that clear icy night we looked down on the patterns of snow angels made by the school children and then up at the breathtaking spectacle of the dancing lights in the heavens and the old carol came alive to me. "Angels from the realms of glory,wing your flight o'er all the earth". 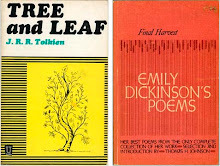 There had been loving letters and Christmas parcels in the mail that day, and our letters and parcels had been mailed home. Perhaps I would make it after all. 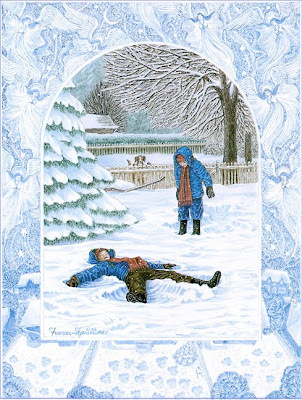 When I told this story to Frances, who was born in that town but has no memory of it, she painted a Christmas card for me of children making snow angels in a southern Ontario suburban garden. The winters are milder here and snow doesn't always arrive in time for Christmas, but when it does arrive the children will make snow angels and, were it not for the city lights, we might look up and see the angelic flight "o'er all the earth." Happy Christmas, wherever you may be. This is quite the most beautiful piece of Christmas writing ever to be penned in all of Blogdom! I hope your wrist is healing and that you carry on to create even more wonderful posts in the New Year. With all good wishes to you and your very talented daughter, love from Cheshire, England. PS, I could not wait for Christmas to read Frances's book! It was everything I expected it to be and more. Such a beautiful story! And painting. Wishing you a lovely Christmas week! And hope your wrist feels better! Thanks for voting for the bees! It is very late to be wishing you a Merry Christmas, but maybe I can just be early for next year? Actually I wish I had discovered by blog and your story at Christmas. I have many friends and family who would have enjoyed reading it. Then again, as I say, there is always next year. I hope your wrist is better.